Learn everything you need to know about morning sickness. Learn morning sickness remedies to stop the nausea quickly. Live your day normally again without feeling sick. Control morning sickness naturally and safely. Reduce stress, feel healthier, and have more energy. Morning sickness is an unwanted and debilitating side effect for pregnant women. It is characterized by nausea and/or vomiting during the pregnancy. For a large majority of women the morning sickness occurs during the early stages of pregnancy and is most common in the morning. However, it is not unusual for it to occur at anytime of the day and there have been cases where women have had morning sickness throughout their entire pregnancy. Morning sickness effects as much as 80% of pregnant women and can last the entire duration of the pregnancy. Normally the chances are that if you had morning sickness with a previous pregnancy that you will once again get morning sickness with any future pregnancies. Studies and polls have shown, however, that morning sickness is more obvious and/or severe if the mother is carrying multiple children (twins, triplets, etc.). Morning sickness is normally the first sign of pregnancy. In fact, it's not unusual for a person to realize they're pregnant until they start showing signs of morning sickness. Usually morning sickness will start anywhere between the fourth and sixth week of pregnancy and it will usually last until the third or fourth month. However, some women report suffering from morning sickness for the entire duration of their pregnancy. Believe it or not, there are actually some benefits that come from morning sickness. Many researchers believe that morning sickness is a way your body protects the embryo from harmful enzymes and nutrients not needed for the child. Researches suggest that this is one of the reasons why morning sickness is more prevalent in the first trimesters, since it is at those times when the embryo is most sensitive towards the nutrients it receives. Researches have also found a link between morning sickness and healthy pregnancies. Studies have shown that women who suffer from morning sickness have less miscarriages and still births than women who do not have morning sickness. Sea Bands - Sea bands are bracelets that you wear if you are going on a cruise or any type of boat and suffer from motion sickness. The idea is that when these bracelets put pressure on your wrist in the right spot, it will block or dull the nausea feelings from your stomach to your brain making you feel less ill.
Zofran - Zofran (Ondansetron) is a powerful medication used to treat patients undergoing chemotherapy for nausea and vomiting. Thorough tests of the drug have not been completed to make sure it is completely safe for use during pregnancy or breast feeding, so the FDA has classified the drug as Pregnancy Category B. The FDA's statement is the drug should only be used by pregnant women when the benefit outweighs the risk. Unisom - Unisom was originally intended for a vomiting/nausea remedy, but the main side effect including drowsiness, which is why it is now marketed as a sleep aid. The FDA has classified Unisom as a Category B for pregnancies. However, Unisom can pose a risk to newborn infants so it is highly recommended not to take while you are breast feeding. Vitamin B6 - Vitamin B6 (as well as other B-Complex vitamins) have been used to help relieve morning sickness in pregnancies for several decades. However, newer research indicates that patients with severe nausea receive more improvement from taking vitamin B6 than patients with mild to moderate nausea. Ginger - Ginger has long been used to relieve upset stomachs and has been a popular remedy for morning sickness as well. However, researchers suggest not taking more than 1,500 mg per day and not to take it for more than 4 days in a row. This is because very little research has been done on ginger and pregnancies. It's also recommended to avoid ginger extracts as a 250 mg dose of an extract could the equivalent as 2,500-5,000 mg of ginger. Acupuncture - Acupuncture is used to relive tension and stress within the body to make it more relaxed and to function better as a whole. With this being said, recently a study was done where 600 students suffering from morning sickness underwent acupuncture treatments for four weeks (one treatment per week). A majority of the patients noticed improvement with less symptoms by the second week. How to Get Rid of Morning Sickness Fast? We have created a morning sickness guide which contains all the techniques within this site, including home remedies and tips we are not allowed to mention to help you stop your morning sickness. The techniques within this guide are natural and safe and can work in as little as 24 hours to stop your morning sickness. Morning Sickness Learn everything you ever wanted to know about morning sickness. Morning Sickness Remedies Discover countless remedies designed to stop your morning sickness. 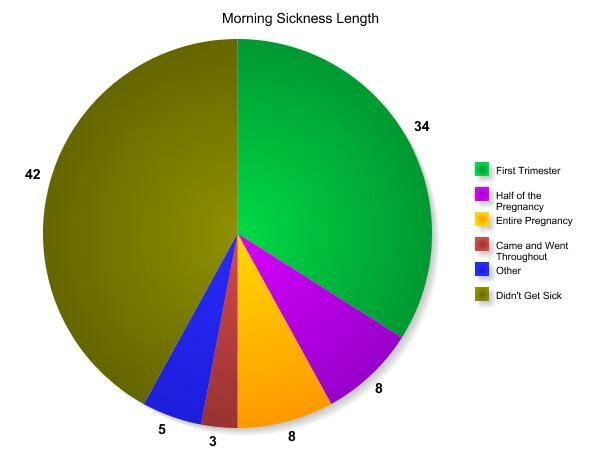 How Long Does Morning Sickness Last Learn how long morning sickness will last each day and for the pregnancy?